With the support of our industrious unit of professionals, we have become the leading manufacturer and supplier of supreme quality Saw Grinders all across the country. We manufacture these grinders using superior quality raw material and most advanced technology. These machines are used widely for sharpening saw machines and chains thus increasing their working life considerably. Our products are available for the clients at decent prices. Sharpen the teeth of your tool and bite an extra slice of profit with the help of our brand new TCT Saw Grinders. Designed by our diligent team of professionals, these grinders stand apart from others due to their cutting-edge technology and unmatched performance. We manufacture them using the best quality raw material available in the market. These machines are available to our clients at pocket-friendly prices. Now our clients can sharpen their chain saws tension free with the help of our Saw Chain Grinder which are now made available in the market. Our grinders are extremely strong and sturdy in their operation and can sharpen the bluntest of tools to the perfection. Manufactured using premium quality raw material and recent technology our products are incredibly efficient in their functioning. 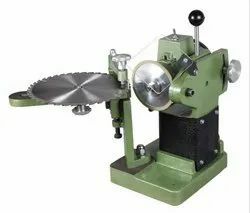 Looking for Saw Grinders ?